Well, first of all…I have been a fan of Dar Williams for many years. I was even late to the party. I wasn’t aware of her until “The End of the Summer” was released. But once I heard it I quickly went and got all her previous releases. By then, I knew I had my new favorite artist. 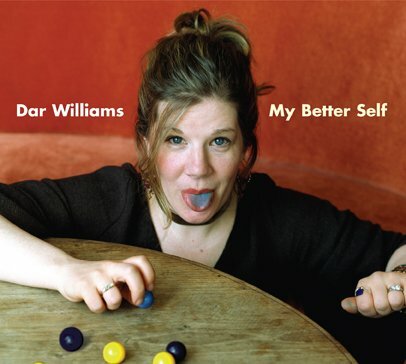 So it’s not that Dar Williams can do no wrong in my opinion. Just that…well, I love everything she does (and no, that’s not the same thing…because I said so, that’s why). “Miss You Till I Meet You” is a very sweet song with lovely backing vocals. “Echoes” is the first single. Though it’s a great song, she did not write this one so I hesitate to say it’s the best. But I do love the message: that everything you do “echoes” around the world. Everything matters. It’s true! “Comfortably Numb” (yes THAT one) is a gorgeous remake. It features another musical goddess, Ani DiFranco (if only Sarah McLachlan were singing on there too, you’d have my perfect trio). It’s even more haunting than Pink Floyd’s original. “So Close to My Heart” is a beautiful love song written to her son. It’s sound is, to me anyway, most like earlier Dar Williams songs. For some reason it reminds me of Peter Himmelman, as well. Lovely. Another favorite of mine (who am I kidding? they’re all spectacular) is “You Rise and Meet the Day”. The melody is so, I don’t know, comfortable? It makes me smile. This is a great CD by a stellar musician and if you don’t get yourself a copy you will be doing yourself a great disservice. Those of you who already love Dar’s music and know what she has to offer will not be disappointed. Those of you who are new to her music will surely become new die-hard fans and will begin buying all her CDs Start at the beginning, with The Honesty Room. Comment: I am sixteen years old, and discovered Dar’s amazing voice and writing ability last summer. Dar is an amazing musician because her songs are like beautiful sculptures; she also has a crystal clear voice as heard in the first song on her latest CD, “My Better Self” Teen for God. This song is special to me because I am an artist in my own rite, and it shows her artistic talents in the most personal way. This CD is a special blend of spirituality, and color in the songs as seen in one of my favorite songs Echoes. The way she mixed this song is especially innovative because as I listen to it I picture myself sitting in an old concert and as the song starts the lights start going. It is an extremely visual song. “My Better Self” is a journey of emotion and hope, as seen in Miss You Till I Meet You. It is an adventure of change. It is a journey to find the self you don’t expect to be looking for until you find it. For me this album starts my “hunt” for my better self. Thanks Dar!! Keep up the Fabulous Work!! !